I used it in automode and found gould on the bedrock crack, it was awesome the gold was so small, I was using the Micro tiru 140 mm shooter coil. Gold was smaller than a rice grain. I always manual ground balance and make it a little hotter by hitting the + button 2 times after balanced. I also use the nugget shooter coil for covering bedrock. 2 weeks ago at Rye Patch, I found 2 small pieces of gold, smaller than a grain of rice with the stock coil, while my buddy with the GB 2 did not find anything. Not only has the GMT been a disappointment but, after years of using the Bulls eye detector, I took it apart. The U - tube videos show about 1/4 inch detection. When I took it apart the switch is held in place by two little microscopic pieces of plastic. The switch is not soldered in place. The switch then has a wire coming off it that is looped around one of the leads of diode 4042. No solder lug or node. This connection is held in place by ( I kid you not) a dab of hot glue. Whites cannot possibly pay me back for the many years of erratic operation of this pinpointer. I urge everyone who is thinking about buying the new pinpointer from Whites at $168.00 DON'T. Please, please don,t reward incompetence!!!!! Al from Show low A.Z. I've owned 4 to 5 GMT's over the years, found gold from grams to 16 oz nuggets, 100's of ozs. Walk through old prospectors camp sites, just listen to the tone with discrimination on and find gold amongst the junk. Don,t listen to those guys who say their no good, they are a top machine for the dollars. This Machine is as Good as they get, why some of you are using it for finding coins shows how little you know about detecting against prospecting, and if a shop keeper cant get it to see nuggets then he's a scam artist. This machine will find gold that small you need tweezers to pick it up and it is extremely powerful. On Large Nuggets it will see them very deep, If any one here has had a problem with it not seeing targets then it is either operator error or a fault in the Coil/Machine, these are at the top of the pile when it comes to gold, these and the GBII are the Kings of Prospecting out of all the VLF's. I have used the GMT in California, Nevada and Arizona as well as other states. Many hours of use with much reading and learning from whites GMT video. Sorry PR guys I agree with first guy. The GMT is a dog!!! After four years I can't tell you how disappointed I am. If Whites did nothing more then gave you a chart saying gold falls with in these numbers and aluminum falls in these numbers and brass in these numbers. And, forget about finding any coins with this unit, I agree with Whites this is not a coin finder. Bite the lead and give people the opportunity to either get their money back or, buy up to metal finding units that work. I have had my GMT for 3 years all over CA, NV and UT and have never found one single bit of gold while others have with different brands. I have been running metal detectors since the 70's but this was my 1st gold detector. I thought Gold / Meteorite at $1,000 would be like my discriminator models and only pick up gold / meteorites. I have a ton of bullets, shrapnel, buck shot, even staples ( yes, like you clip 2 pieces of paper together with) but no gold. Took it to a local outpost that sells another brand. He put a gold nugget on the ground (he sells) and it wouldn't even detect it on auto recommended settings! He had to put on audio boost and full gain and then it barely detected a pretty good size piece of gold he was selling. I called the FL place where I bought it, that we've all heard of, explained I'm a disabled Vet with limited income to waste and all she said was call whites. I've never even hooked up the large coil. I am very disappointed being in gold country. I see a question below about copper coin and quarter. I didn't buy it for coins so don't take it places for that. Ironically, the day after telling a friend I haven't so much as found a dime with it, I found a US dime the next day but the only coin ever. It sings on my silver band ring though. In 1 hr with a friend at Rye Patch, he found hold with his old GB2 and I found none in the same site. Would like to have a ML5000 but $ and afraid I'd get another similar experience. Whites gmt this dog will hunt gold! 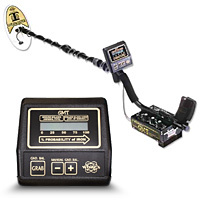 This is a true gold detector. Yes, whites makes other machines that cross the boundaries between coin/relic hunters, but this vlf unit can handle hot ground and can cope with high mineralization that will make other detectors just howl. The ground balancing circuitry that is built in is a snap to use and the hardware on this puppy is rock solid. Some folks say that they are just too expensive, but I contend this detector is far less costly than those $5k buggers, and a lot lighter to carry around. If you want to go for gold, get your hands in this machine(if you can)and do not let go... You will find what you are looking for! I have a hearing problem, 50 percent gone and not a lot left. Where I work my GMT, I have no man made noise but lots of constant strong wind in the eucalyptus, makes life very difficult with near constant noise. Very rarely the wind is quiet but then a pleasure to get the headphones off. I find the GMT speaker quite adequate in volume with good sensitivity and tone. In my opinion Whites Gold Master GMT is the best gold prospecting metal detector on the market, so if you've just got one, why not treat yourself to the best headphones?? Why waste your money, I've done lots of that for you to end up with the best. With or without good hearing. DETECTORPRO "BLACK WIDOW" .. Get only the Black Widow model. cheers Chris. The GMT follows the pay streak! The larger coil 8x14 is still as sensitive as the smaller coil and will go deeper. This machine is my standby and main machine...I own 2. It beats the other vlf machines because you can follow magnetite! I have found more than enough gold to pay both machines off 3 times. I wish I had more time!